WE FEEL SAD for two local films that were shown last week but quickly went out of the theaters, “The Hopeful Romantic” and “Wander Bra”. We think it’s a case of very bad timing for them since three local movies that preceded them are all big hits and are still extended in several theaters: “Goyo, Batang Heneral”, “Miss Granny” and “The Hows of Us”. Aside from those, two blockbuster Hollywood films are also extended, “Crazy Rich Asians” and the horror franchise “The Nun”. Then there’s a new sci-fi action flick also opened, “The Predator”. So what do you think are their chances against those blockbusters? 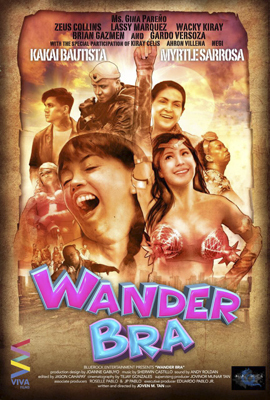 Both “The Hopeful Romantic” and “Wander Bra” starred fairly new actors with no proven clout yet at the box office. Pepe Herrera and Ritz Azul for the former and Myrtle Sarrosa and Kakai Bautista in the latter. So you can’t really blame the bookers for being biased against them. How sad, really, and all we can say is better luck next time. Personally, though, we think it was premature for Pepe to be launched in a starring role since he’s still relatively new in showbiz. Other comedians like Empoy Marquez and the late Rene Requiestas paid their dues before doing supporting roles to more established stars before they were launched. In the case of Rene, it helped, of course, that he was first paired with the presidential daughter then, Kris Aquino, in her very first movie, “Pido Dida”. As for Empoy, it now looks like he’s a one hit wonder. After “Kita Kita”, his succeeding movies like “The Barker” and “Kusina Kings” didn’t do so well at the box office.